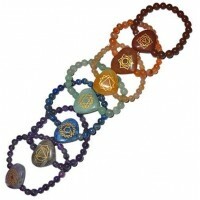 This set of 7 Chakra gemstone bracelets are great for meditation or reiki healing. 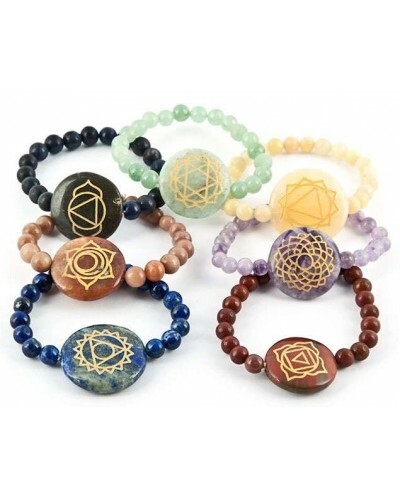 Each of these 7 polished gemstone bracelets align to one of the 7 chakra energy centers in the body - exact selection of stones may vary depending on availability. Perfect for meditation or spell work, they are carved with the chakra symbols in gold with matching beads on an elastic band bracelet. 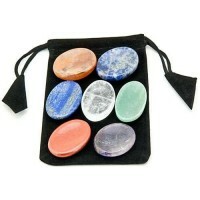 Note that these are shaped, natural stones so their sizes and colors may vary from that pictured. 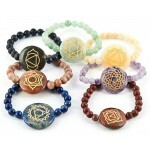 Central disc is about 1 inch diameter. Item Number: OI-CHKR11 | Approximate Size (Inches): 4.00 wide x 2.00 deep x 4.00 high | Approximate Shipping Weight: 1.00 lbs.